Home > Shop By Brand > BLACKFIRE Pro Detailers Choice Car Care Products > BLACKFIRE Polish 32 oz. The best polish for any type of finish! To stay on top of paint innovations, BLACKFIRE incorporated cutting edge German abrasives to develop a compound and polish to remove defects in the new clear coats. This new breed of polishes is currently used at the OEM level in various auto manufacturing plants worldwide and they are considered within the polishing industry to be the most advanced polishes in the world. It will restore gloss and remove minor defects in clear coats. It will restore gloss and remove minor defects in the new scratch-resistant clear coats. BLACKFIRE Polish will remove any existing wax or sealant and burnish the finish to a mirror-like shine. 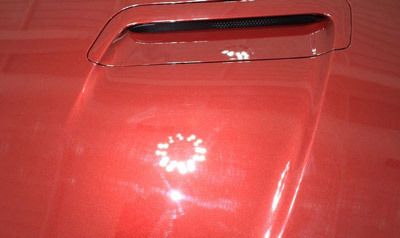 Applied by machine, it will remove 2500 grit swirls, spots, and scratches without hazing the finish. It is, in a word, remarkable. BLACKFIRE Polish is recommended for use on all clear coat finishes. Containing no silicones or waxes, BLACKFIRE Polish is VOC Compliant and body shop safe. 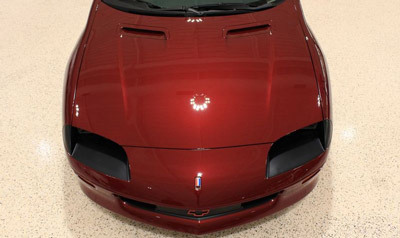 Using BLACKFIRE Compound and BLACKFIRE Polish, Mike Phillips was able to completely remove the swirls and paint imperfections and polish to perfection the paint on this 1994 Z28 Camaro. Apply with a dense foam applicator or microfiber applicator. mist clean pad with pad conditioner. Apply a nickel-sized amount of polish onto applicator. Work on a 2 x 2 sq. ft. area. Wipe polish over paint using short, firm strokes until polish starts to turn clear. Wipe off immediately using a microfiber towel. Application with a dual-action machine polisher: Work on a 2 x 2 sq. ft. area. Mist a clean foam polishing pad or finishing pad with pad conditioner. Apply an X of polish onto the pad. Spread the polish over one section with the machine turned off. Set the speed at 4-5 on a dual action polisher or 800-1,000 RPM on a rotary polisher. Work the polish over the surface until it begins to turn clear. Buff of polish by hand using a microfiber towel. After final buffing open all doors, the hood, and trunk and wipe body panel edges. Mist a detail brush with a quick-detail spray or residue remover and brush around emblems. Larger body moldings and wheel arch moldings can be cleaned with a quick-detail spray or residue remove or do what body shops do, mask off these moldings before you start polishing. Soak dirty foam pads in a bucket of soapy water (or with BLACKFIRE Citrus Pad Cleaner), agitate pads with your fingers, rinse with fresh water, hand squeeze out excess water and allow pads to air dry. After polishing, finish with a coat of your favorite wax or sealant. Made in Germany 32 oz. We can use in the body shop, no silicones! Great to use after the compound to get the paint perfect.